New Riders must learn how to mount the horse, go forward, stop, turn left and right, as well as balance their bodies in the trot and canter. This becomes the foundation of the lessons for beginners or those needing some help in these skills. These riders will start on a lunge line, where the instructor uses a long line attached to the horse to help in the initial control and give the new rider more security. Each lesson will have some portion of time off of the lunge line learning how to steer the horse as well. 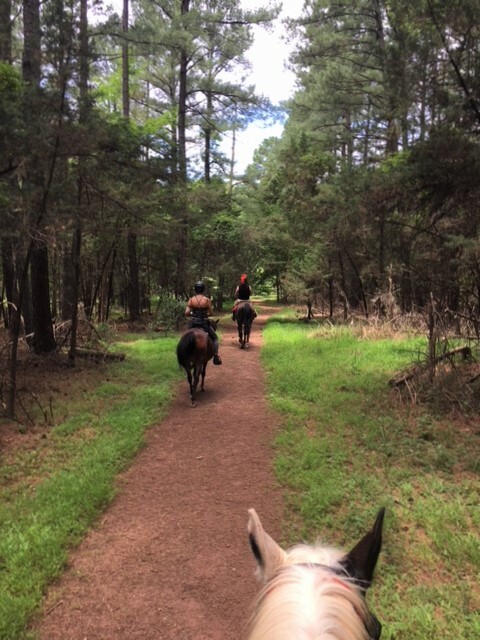 When riders have conquered the basic skills of Balance seat riding, they can move into other disciplines of riding such as dressage, jumping, cross country riding (riding out in our beautiful Virginia countryside), trail rides, and western sports as well. Students may choose to ride for their own pleasure or may want to learn the competition skills for certain disciplines. Dressage lessons teach the rider how to balance and supple the horse to make the horse more rideable and the ride more enjoyable. Dressage lessons are matched, first, to the rider’s ability, and as the rider improves, more advanced dressage skills are learned. Riders learn to meet expectations of the horse and rider’s performance as set forth in a series of progressively more challenging dressage tests. Dressage tests specify what the horse and rider are expected to accomplish from an introductory level, through the first and second training levels and onward. 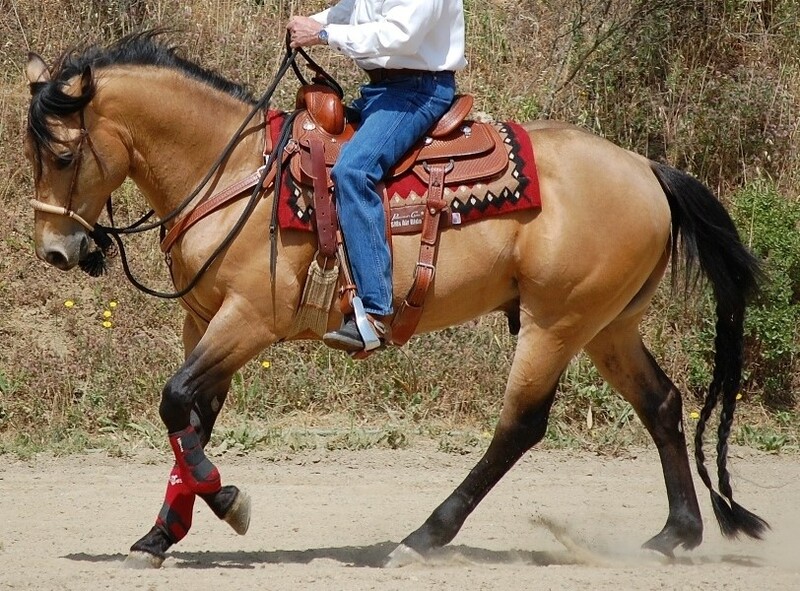 We will teach Western Riding techniques for your specific interest, event or within western competition where a horse performs a pattern that combines trail or reining elements. Riders will learn balanced seat western riding in the beginning. When the student can handle the horse at the walk, jog, and lope, the instructor will take them out and teach them how to trail ride. Riders wishing to learn cutting, reining and team penning will need to further their turning skills with their seat and legs. The United States Equestrian Federation recognized the Western Dressage Association of America (WDAA) as the sole affiliate representing the discipline of Western Dressage. It was only natural that at some point on this journey east would meet west, English would meet Western, and Classical Dressage would meet the spirit of the horse. The WDAA discipline formed the guidelines taught at Lantern Lane Farm. Debbie’s education in Classical Dressage transition her to the ideal partnership of light hands, subtle cues, and an appreciation for the ultimate benefit creating a true connection between horse and rider. Riders wishing to learn Hunter, Jumper, Hunt Seat will start riding over poles and cavaletti as soon as they are able to keep their balance in two point position. Then go back to rising trot without losing their balance or the rhythm of the trot. Next, the rider will be able to balance themselves in the canter. A course of riding trot and canter poles will be followed by learning to ride over cross rails and then to small verticals. 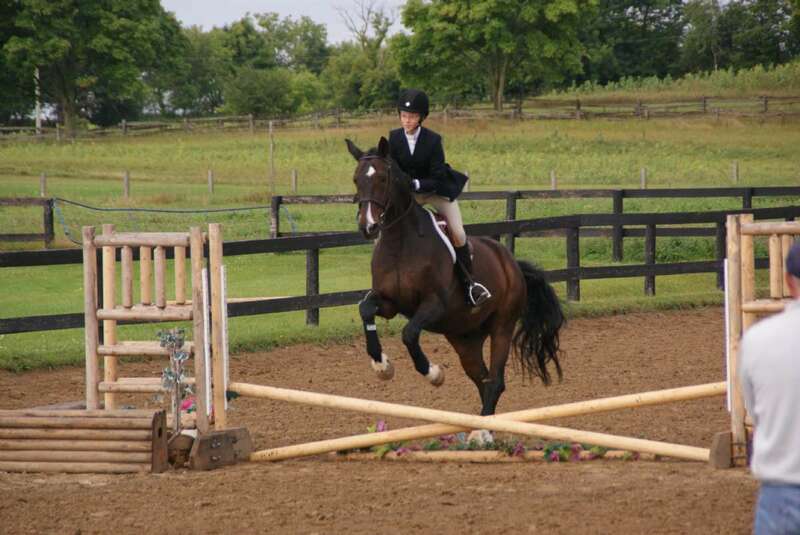 Once the student has learned to ride the individual fences, the instructor will put them together and teach them how to ride the jumping course. Jumping courses will increase in difficulty as the students skills improve. Students wishing to show A circuit hunters will be referred to an appropriate show instructor. Please note that the mileages and times are estimates only, your time will vary depending on the speed that you ride. We teach natural horsemanship principals in all of our programs. 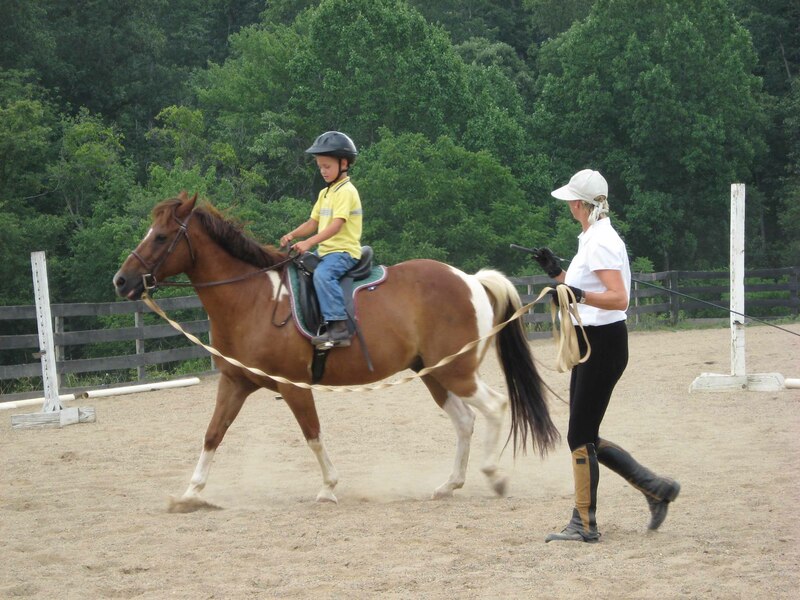 Our objective is to give riders the skills to build trust and understanding with their equine partners. We give detailed instruction on how to use the exercises and tools offered by the Natural Horsemanship Training programs. Debbie studied the Cowboy gurus, Clinton Anderson, Dennis Reis, Pat Parelli and Julie Goodnight (Cowgirl) and is ready to apply the best of their practices.. All of our horses are trained and schooled in natural horsemanship techniques. 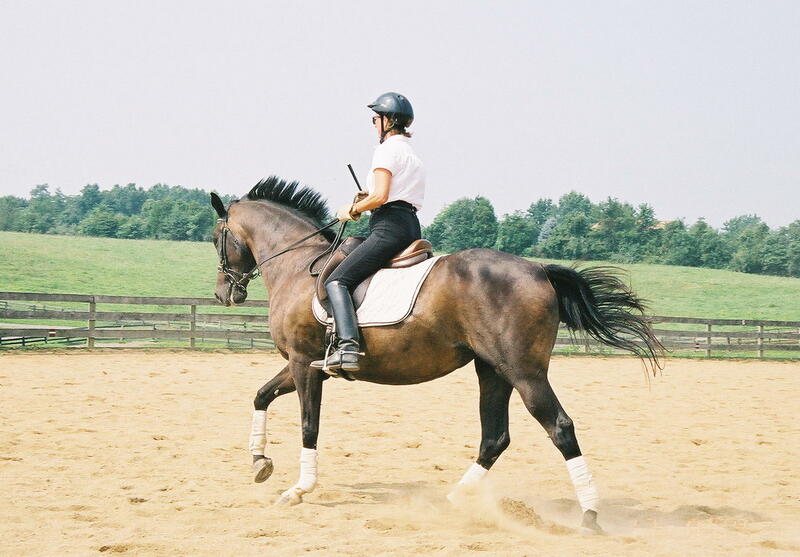 Essentially these techniques teach the horse to move away from pressure while the rider is on the ground and in ways the rider will eventually ask the horse to perform while being ridden.